Dan Skelton's Get On The Yager doubled his tally of victories over fences when backing up his previous success at Fontwell with a hard-fought win in the Grade Three Rowland Meyrick Handicap Chase. Skelton said: "He was brilliant. The whole way up the straight I was hoping the post was going to get further and further away as I knew he would just keep getting there. 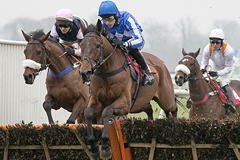 "It was a great performance and the horse is obviously going the right way. I don't know what I was doing in those first two runs. He was all at sea, but he has got it together now. "Immediately afterwards we talked about the Classic Chase at Warwick, but I think that will come too soon. "I think we will end up leaving him for the Midlands National as he looks the ideal type for that race."